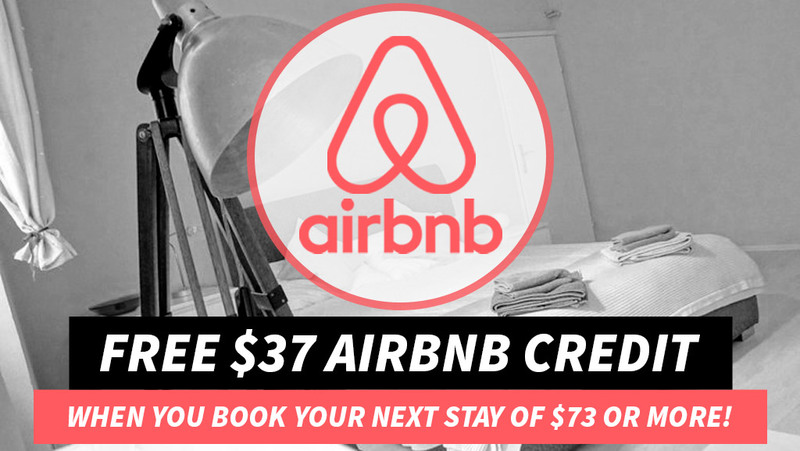 The Top 15 Photos from our Travels to Greece! 1 1. The Incredible Sunsets of Santorini, Greece. 2 2. 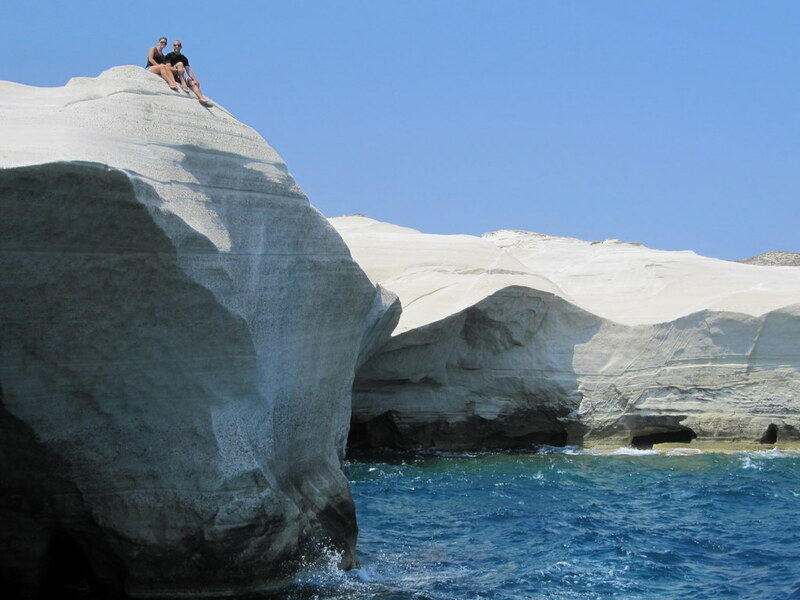 Liz & I sitting on the white volcanic cliffs of Sarakiniko Beach on the island of Milos. 3 3. Taking a pitstop along the southern coast of Santorini. 4 4. “The Pigeon Girl” out front of the Parliament Building in Athens. 5 5. An old Honda scooter with a custom Greek paint job. 6 6. Kisses from Santorini! 7 7. 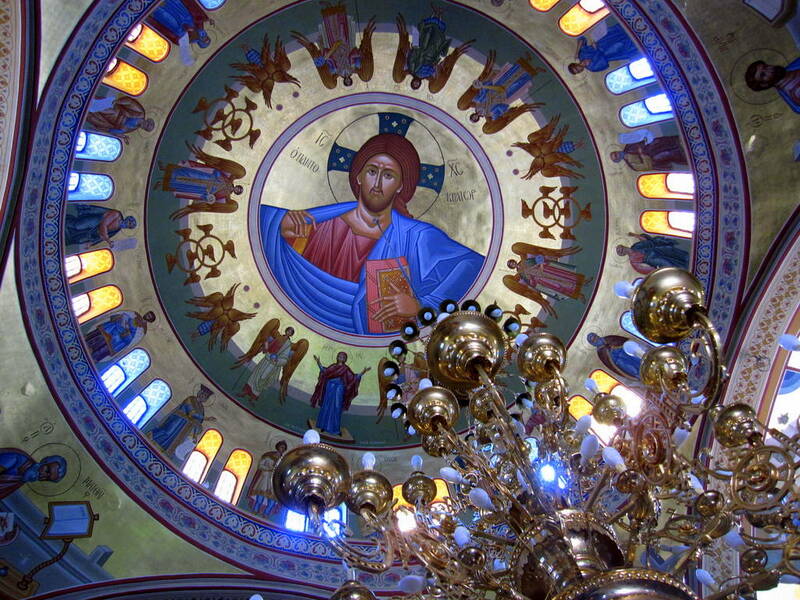 Candelmas Cathedral Church in Fira. 8 8. 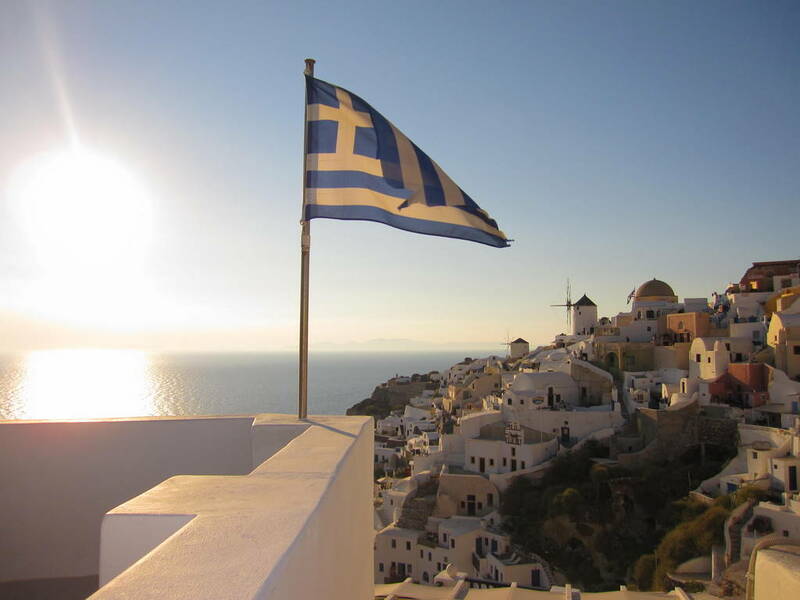 The Greek Flag waves over the white washed homes of Oia. 9 9. A beautiful day at Perissa Beach. 10 10. 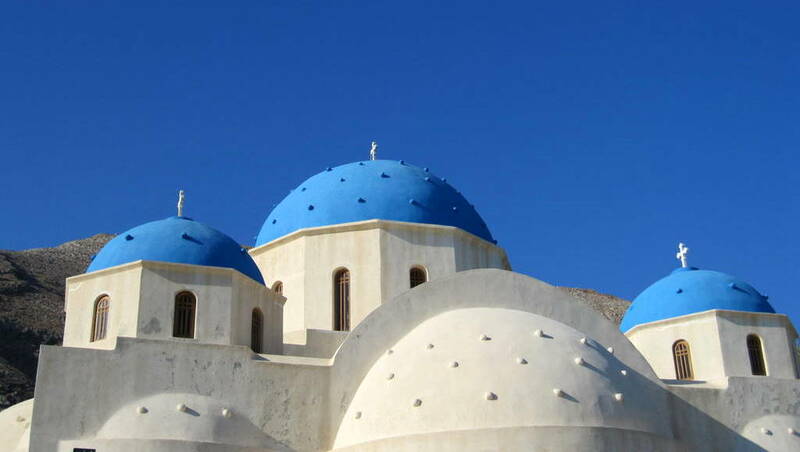 The blue domes of Perissa. 11 11. The best food in Greece. In my opinion! 13 13. 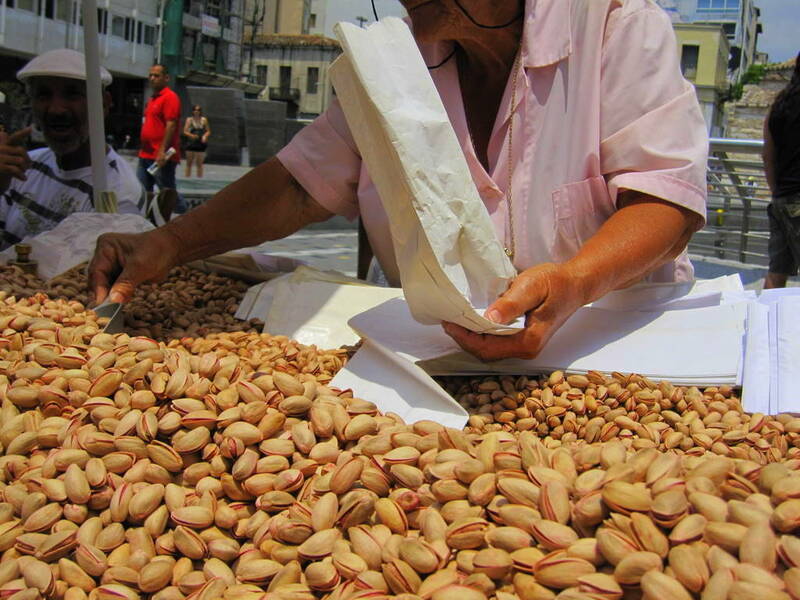 Pistachios for sale! 14 14. Slowsky the friendly turtle. 15 15. A young man shaving fresh chicken at a Gyro stand in Athens. 1. The Incredible Sunsets of Santorini, Greece. 2. Liz & I sitting on the white volcanic cliffs of Sarakiniko Beach on the island of Milos. 3. 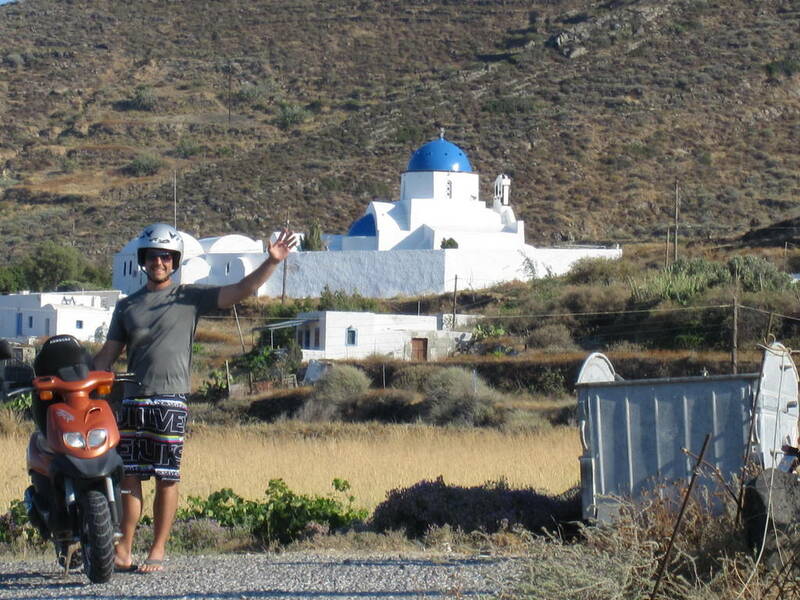 Taking a pitstop along the southern coast of Santorini. 4. 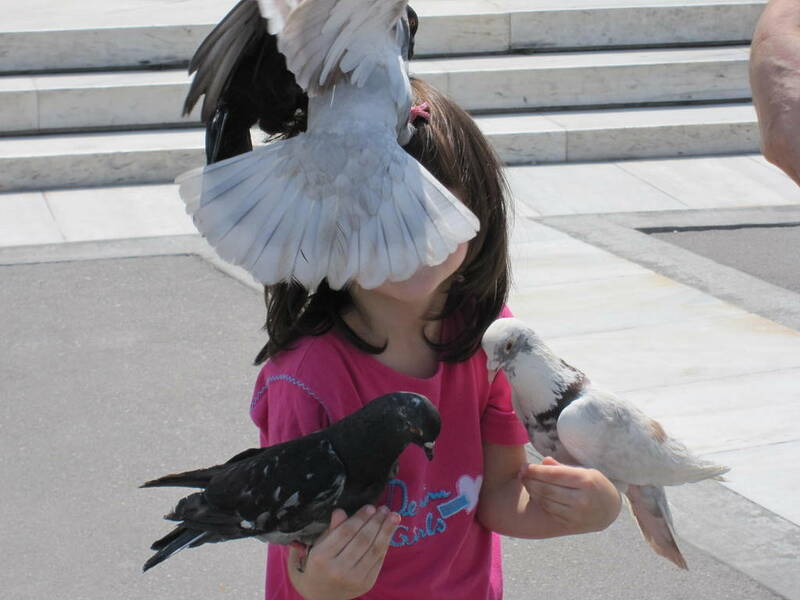 “The Pigeon Girl” out front of the Parliament Building in Athens. 5. 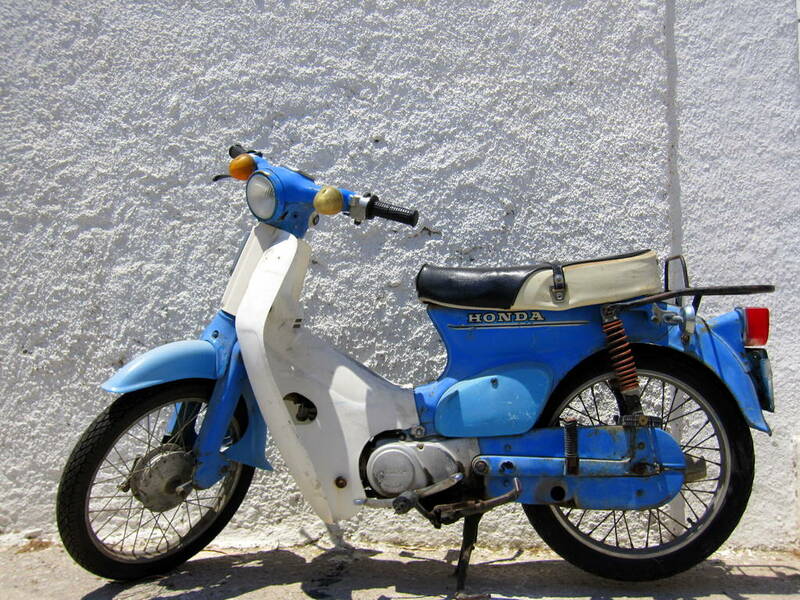 An old Honda scooter with a custom Greek paint job. 7. Candelmas Cathedral Church in Fira. 8. The Greek Flag waves over the white washed homes of Oia. 9. A beautiful day at Perissa Beach. 10. The blue domes of Perissa. 11. The best food in Greece. In my opinion! 14. 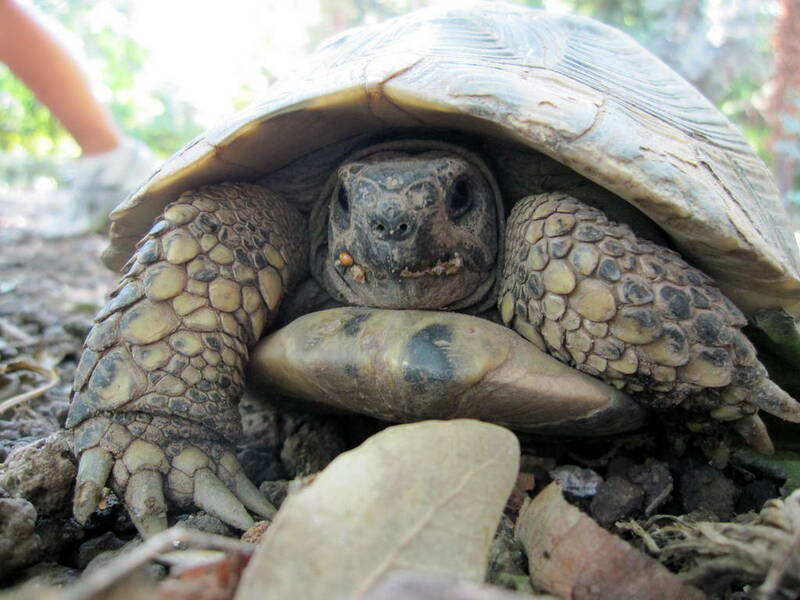 Slowsky the friendly turtle. 15. 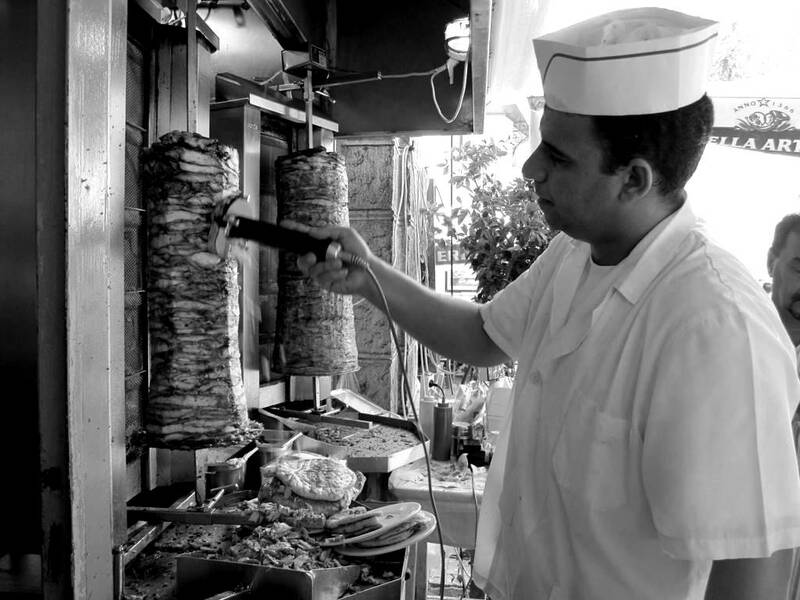 A young man shaving fresh chicken at a Gyro stand in Athens. Great pics! Greece is one of my favourite countries – beautiful scenery, cute villages, soft sandy beaches, and some of the most turquoise blue waters I've ever seen. The smiling goat looks a bit freaky to me, something do do with his eyes.. Thanks, Greece was very beautiful just as I had always thought it would be. 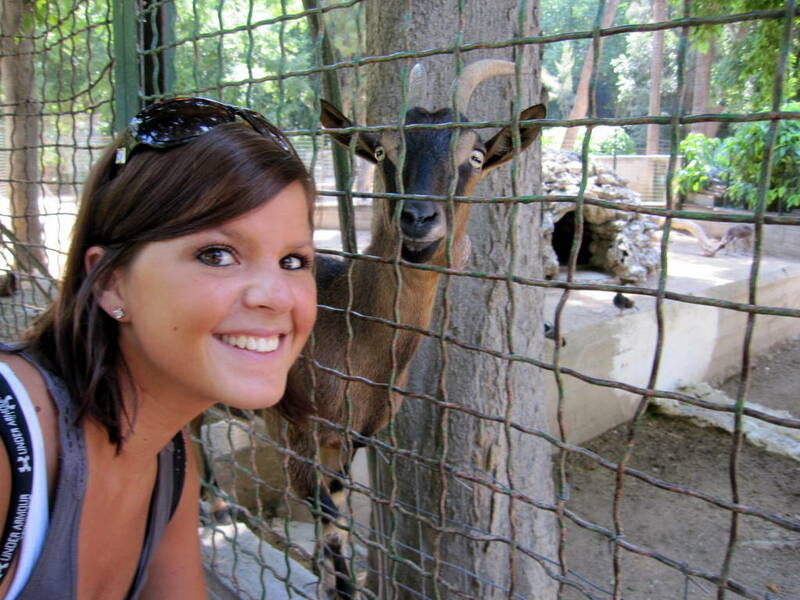 The smiling goat was so funny! The eyes are a bit creepy though, huh? There's french fries in that Gyro!!! 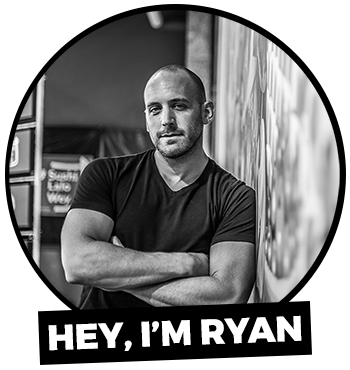 Ryan, Liz, these are all awesome pictures. I love the way the houses look in Greece, as if they've been the same way for thousands of years. Pigeon girl seems interesting. Surely! Always French Fries in my gyros! That's the only way to go my man! The pigeon girl was very interesting to say the least. This guy was throwing the pigeon food in the girls hair and everything. YUCK! 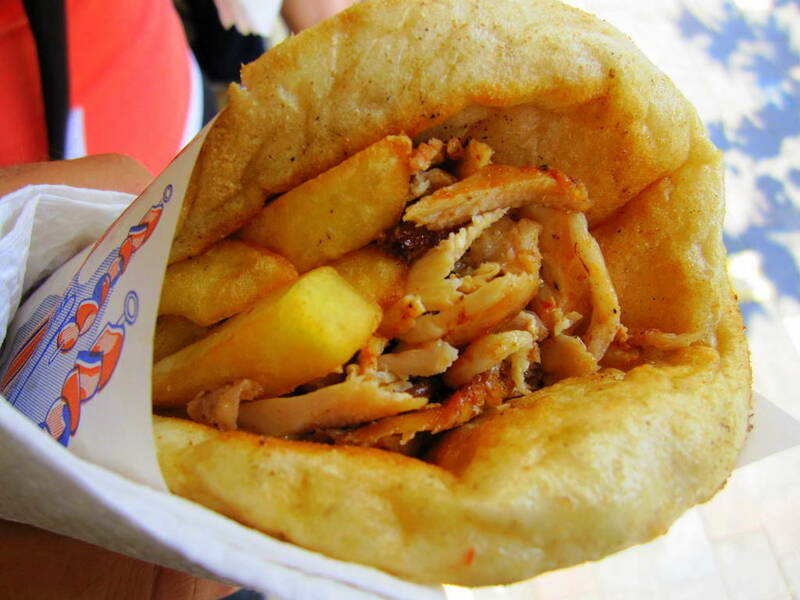 We love that Greek gyros, it usually comes with french fries inside! Oh my god, don't remind me! The best 2 Euros that I've ever spent! 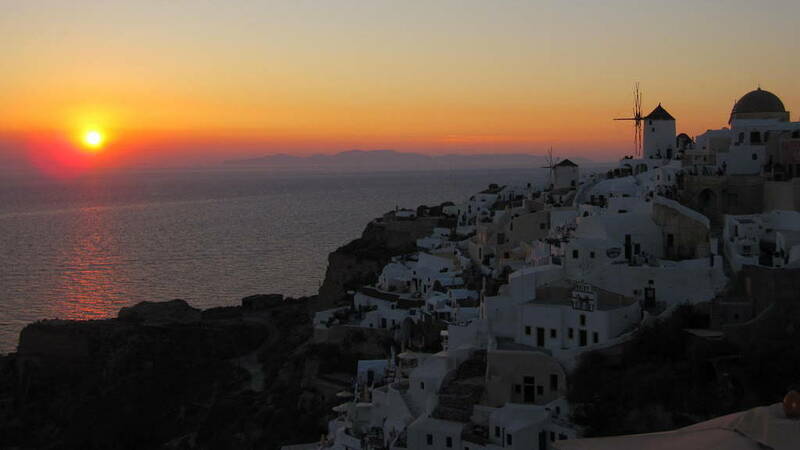 After so many places, Santorini remains one of my personal favorites in the world. So beautiful. Love to revisit it when I see other people's photos! Thanks for bringing me back there today. Thanks Nico, I agree. Santorini is such a beautiful place! What kind of camera do you use? Great pics! Hey Choooch, Thanks for the feedback! I shot these with a Canon PowerShot SD960IS 12.1 MP Digital Camera. I highly recommend it for traveling if you don’t feel like lugging around a Canon EOS Rebel T2i like I do nowadays.